As I walk down the drive of a morning, bleary-eyed and half-asleep, heading out for the first constitutional of the day, there are a few things I quite naturally expect. I expect that Sniff will be bounding ahead, peeing and sniffing as per usual, occasionally casting a backwards glance at me as if to say "Get a move on! "; I expect there to be the same two crested pigeons strutting on the lawn, pecking at the bare earth between the sparse tufts of grass for whatever it is that crested pigeons eat; I expect to stop and check up on the two curled-up balls of gray fur in the possum nest in the tree by our rotting gatepost to make sure they've survived another night of plunder; I expect Sniff to sniff afore-mentioned tree and to whine in frustration because he cannot reach the possum nest; I expect to be dive-bombed by a noisy miner or two squawking in their hideous fashion; and I expect to have to brush the odd cobweb from my face, built across the drive overnight by the ever-zealous golden orb weavers. 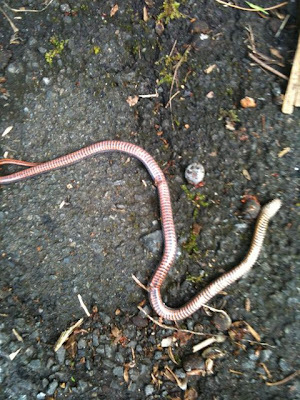 What I do not expect to come across, lying dead in the middle of the drive, is a snake. A SNAKE!!!! After all, our neighbours, who I now obviously cannot trust an inch, told us in our first week here that the only snake they have seen in the neighbourhood in twenty years was a non-toxic python. Now there is something heart-stopping about coming across a snake: they are such rare creatures after all and unutterably shy, doing their utmost to avoid us humans if they can. So if you do see one it's normally out of the corner of your eye as it scuttles into the undergrowth. 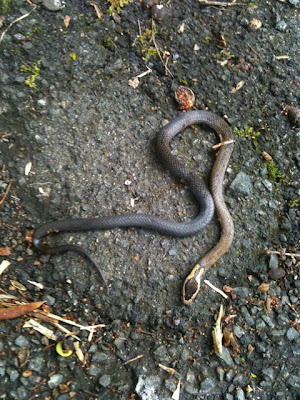 But here it was, this morning, revealed in its full, albeit deceased, glory: a snake. This led Daniel, the native amongst us, to believe that it was an immature Red-Bellied Black Snake as the belly was indeed pinkish and the snake indeed rather small. Ordinarily the Golden Crowned Snake is exceptionally difficult to spot because it is nocturnal, emerging at the same time as possums of a night to hunt for frogs, sleeping lizards and even other snakes. And not only is it nocturnal but it is also very secretive...which means that we could be surrounded by them without ever knowing. They are probably curled up underneath the house in their thousands; perhaps our drive positively writhes with them of a night. I shall watch out over the next few days to see what happens to our Golden Crowned Snake. I've moved him (or her - my scientific investigations were really rather limited) to the side of the drive so we don't drive over the body. Will it be eaten slowly by ants or swallowed whole by a magpie? Will there be a nightly vigil over the corpse officiated by its mate and offspring? Will our neighbours admit their foolish error when I point out the snake to them? Can you milk venom from a dead snake? Questions, questions. For those of you thinking "Oh God, nature blah, blah, nature blah, animals, birds, blah, blah" I am going to be racking my brains to think of something I like about Sydney that has nothing to do with nature for my next few blog entries.